Australian unions have rallied in Melbourne and Sydney to increase the worldwide pressure on the South Korean Government to cease its brutal attacks on the Korean Confederation of Trade Unions and the railway workers and respect the human rights of all unionists. Major Australian unions pledged solidarity and support for the KCTU and KRWU, whose 23-day strike against privatization resulted in 4600 riot police backing 900 SWAT Squad enforcers in a violent invasion of the headquarters of the peak Korean Confederation of Trade Unions. The strike ended on New Years Eve but the Government has refused to withdraw arrest warrants for 35 KRWU union leaders, charges against 130 unionists arrested in the raid and a $7.7 billion won lawsuit against the KRWU over the strike it deemed illegal. Australian unions protested outside the South Korean Consulate in Melbourne today (Wednesday, January 8) on the eve of a second general strike in Seoul, which follows a street protest by 100,000 people two weeks ago. The president of the Australian Council of Trade Unions, Ged Kearney, praised the courage of 7900 strikers of the KRWU on behalf of the Australian Manufacturing Workers Union, the Maritime Union of Australia, the Rail Tram and Bus Union, the Transport Workers Union and the Communications Electrical Plumbing Union. But Ms Kearney said no worker or union official exercising their right to strike should have to face the intimidation of the kind ordered by the South Korean Government of President Park Geun-hye. The strike was sparked by majority private ownership of KORAIL’s new bullet train extension from Seoul to Pusan, which the KRWU fears will spearhead the gradual privatization of the government system. “What the anti-privatization action of the rail workers did was cause an extreme Government to rear its ugly head, a government intent on breaking workers and violating human rights,” Ms Kearney told protesters. The ACTU President later delivered a letter to the South Korean Consulate in Melbourne re-enforcing demands put in a protest last week in Sydney - to withdraw all legal action. 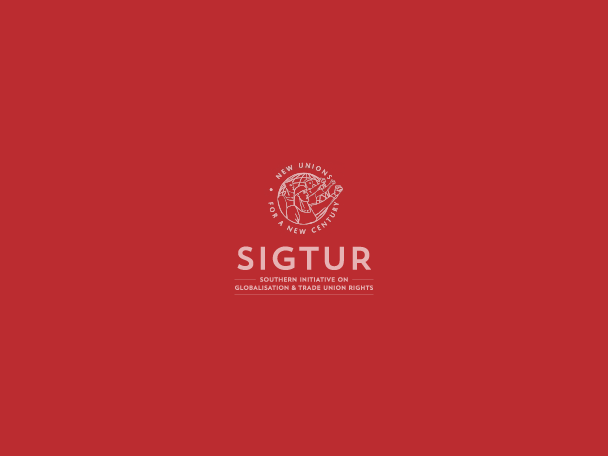 SIGTUR’s Australian representative, Glenn Thompson, said South Korea’s government would never gain international respect or standing until it started behaving like a true democracy and respecting the human rights of workers to take industrial action. “South Korea’s president may openly admire the late Margaret Thatcher but she should know her government has been condemned worldwide by SIGTUR, council of Global Unions, other union groups and Amnesty International,” he said. Maritime Union secretary Kevin Bracken put the government of Park Geun-hye on notice that South Korean diplomatic posts and possibly companies would face continued protests in Australia and worldwide until all legal action and any penalty against the strikers was ruled out. “I was in Seoul and saw those 100,000 people in the streets on December 28, they sat on the frozen ground in a disciplined protest for three hours surrounded by riot police,” he said. The 7900 strikers went back to work after the KRWU reached agreement with ruling and opposition MPs that the union would have input into a new sub-committee on “development of the rail industry” under the Korean National Assembly Committee on Land, Infrastructure and Transport. But the government refused to allow KORAIL to settle with unions to eliminate fines or re-instate 630 workers still suspended.